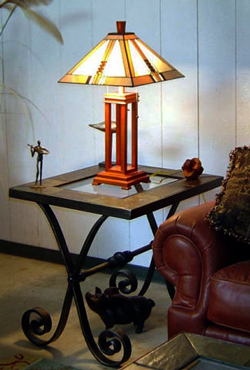 Like the inspired interior design style that grew out of the arts and crafts era (1900-1930), mission style lighting is similar in its definitive lines and edges, dark wood coloring, and a relatively simple appearance. The rustic look of the dark woods is offset by the patterns and colors of the crackled or stained glass. The overall impression of mission lighting, with their flared quality and dark woods, typically resembles natural elements such as spreading roots, angled branches, or broad tree trunks. What sets mission light fixtures apart is their distinctive shape. Usually they are found as a four sided, pyramid base (without the pointed top). Rectangular shapes are also common. Designers of mission style lighting fixtures stay away from the highly decorated styles of previous eras, opting for a cleaner and simpler look. Often inspired by the mission architecture and landscape of the western and southwestern United States, the straight edges mimic the panoramic views that are prevalent in these regions. Darkly stained oak is often used along with various metals and stained, frosted, or textured glass to create the elegant lighting fixture. The leathered appearance of the wood artfully enhances the delicateness of the glass elements, which creates lighting sources that blend easily with several interior design styles. Far from being limiting, mission lighting may be used to enhance existing décor styles, allowing for spaces to be decorated in a more rustic, traditional and authentic way. The clean cut lines are what make mission light fixtures stand out. 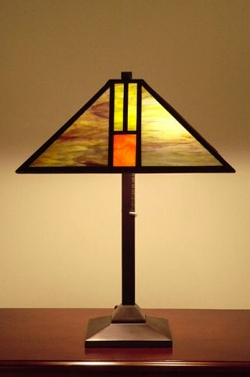 Lamp from Warehouse of Tiffany. Mission styled lighting mixes well with Native American patterns and structural elements, and may be easily paired with handcrafted woven rugs, clay pottery, and similar room accessories. Decorating enthusiasts who prefer American traditional styling may especially appreciate the dark woods of these light sources, and enjoy mixing in richly hued wall paint, seating, and toss pillows. Traditional seating with dark wood accents or dark leather furniture may be greatly enhanced by adding Mission style room elements. Even casual looks can sustain Mission styled lights. A range of lighting designers offer Mission styled ceiling fans, chandeliers, pendants and sconces with a casual elegance that highlights the best of this architectural style. 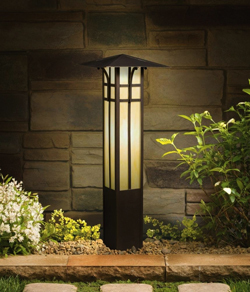 Top companies such as Arroyo Craftsman, Franklin Iron Works, and Murray Feiss produce quality Mission style outdoor lighting. These manufacturers, along with the Framburg, Kichler, and Quoizel lighting companies, also provide interior and exterior lighting options. 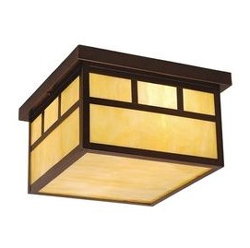 An example of a mission styled outdoor ceiling light, from Vaxcel. A ceiling fan integrated with a mission style light, from Hunter. An example of an outdoor bollard in the mission style, by Kichler.